A young man, Richard Mayhew, finds himseld captured in a secret and dangerous London below the London we know - because of helping a hurt woman called Door. Her family has been killed, and she is seeking revenge for their death. In a fantastic journey with lots of strange characters and scary places (the bad guys Mr. Croup and Vandemar are just stunning), a young man faces the challenge to become a real hero - and it is a thin line between life and death, reality and dreams. The plot is straightforward, but nevertheless compelling and once again affirms the great narrative abilities of the well-known and bestselling author Neil Gaiman. The comics adaptation of New York Times best-selling author Neil Gaiman's acclaimed novel is now available complete in one 224-page trade paperback! 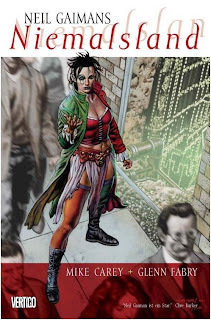 Collecting all nine issues of the Vertigo maxiseries, this volume follows the adventures of an ordinary Londoner who stops to help an enigmatic girl and is drawn into a battle to save the strange underworld kingdom of London Below from destruction.